Adventures of a Starving Artist: Worship Wednesdays - Where Does The Music Go? Worship Wednesdays - Where Does The Music Go? When you arrive at our concert, you'll notice a long green table covered with our CDs. Our 'product table'. We believe strongly in the ministry of recorded music. Not only do you get to take our music home with you, but at the table, we also have the chance to meet people and exchange stories. 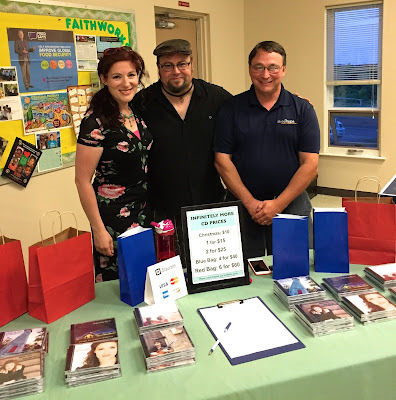 At the product table, after our recent concert at St. John's Ida. Meeting with Darrin Gaudreau, director of Street Hope Peterborough. At the end of the night, we pack up, and move on to the next venue. As our travels continue, we often talk about the church, the event, the community, or someone special who really touched our hearts. But you know what we never used to think about? The CDs. We would lay them on the table, sell them, and never think of them again. That was, until this spring in Trinity, Newfoundland. Partway through the first half of the show, I introduced our original song, "Every Church Is A Small Town." I heard a woman gasp, "Oh, I love this song!" It caught my ear, but by then Gerald was playing the opening chords and singing the first verse. The chorus arrived and I added my harmony. But what was I hearing? Was there some kind of feedback, or echo? Why was I hearing other voices? Because they were singing along! A number of audience members who had bought CDs on our last visit had listened to them so much they had learned to sing along on their favourite songs. Gerald and I were humbled and thrilled. We'd heard stories over the years of people sharing their favourite songs, or letting us know how a particular CD had encouraged them during a rough time, but this was something different. It's already pretty awesome when you lead a group in a song you wrote, but when they start singing along uninvited, well, I just have no words for that. After that moment, we started to become very aware of what was happening to our CDs when they leave our possession. We imagined people playing the discs in living rooms or loading the mp3s on their iPod. They might listen on their drive to work, or while making dinner. Maybe it's their exam soundtrack, or perhaps they choose a favourite song when they need some encouragement. It was brought home to us again this past Sunday at a church in Toronto. A woman told us that she uses our CDs in an exercise class that she teaches! It's not a 'Christian exercise class', but the group loves the songs, so she includes them in her playlist. A use for our music we never imagined on our own! I once heard Gloria Gaither speak about her and Bill's classic song, "Because He Lives." She talked about the third verse and its powerful message of passing from this world to the next. She said she chose that topic for the verse because she felt it was the strongest songwriting choice. A few years later, when struggling with the death of a family member, that was the verse that gave her the most comfort. She told us, "Write great songs, because you never know when you'll need them to minister to you." I would also add, "Write great songs, because you never know where they'll end up." Then, send them out into the world. it may just change someone's life. BIG NEWS: Our New House!